Any frequent visitor to Santa Cruz county Farmers’ Markets knows about Live Earth Farm—if not by name, then by berries. Look for a booth with a large tiered table full of organic strawberries and raspberries in front—that’s Live Earth Farm. They’re the best berries ever—try the samples and you’ll see. This weekend we’ll have a chance to visit the source of these berries, and to “U-pick” as many as we like at the Live Earth Farm Solstice Celebration on Saturday, June 21. This event features activities and fun for the whole family, starting at noon. 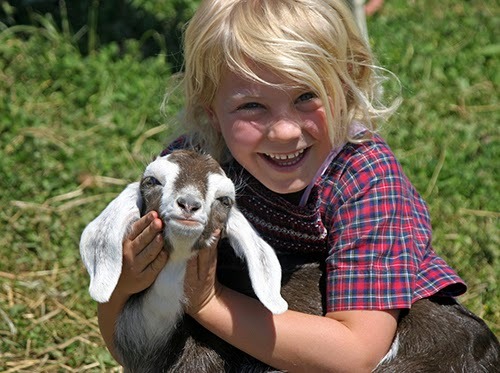 Kids can play in the hay bale fort, make “pizzettes” and bake them in the cob oven, and visit the chickens, goats, and ponies. Adults can U-pick berries and apricots, walk around the farm and gardens, or just laze about on a blanket in the shade. Farm tours, on a tractor-pulled wagon, are fun for everyone, as are the community potluck, marimba music, and bonfire later in the day. Celebrate 2014’s longest day by noshing some strawberries, exploring the fields, and enjoying the farm’s ambiance all afternoon. I’ll see you there. LEF (Live Earth Farm) is 150-acre family farm in south Santa Cruz county overlooking Pajaro Valley, not too far from Freedom Blvd. [Map] Since LEF’s inception in 1996, Farmer Tom Broz has nurtured community and environment as well as a large and growing array of crops. A graduate of Cornell University (B.S. in agricultural plant science) and UCSC’s Farm apprenticeship program, Tom has also worked in village gardens and farms on Samoa, helping communities to increase and diversify their crops. 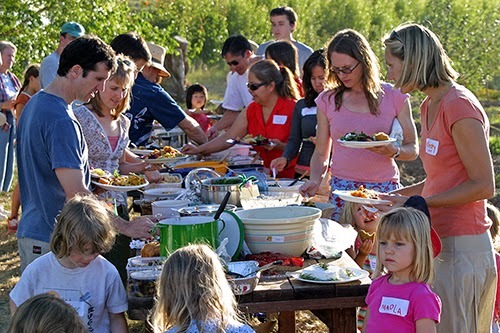 Since LEF’s beginning, Farmer Tom has hosted educational opportunities (now officially the LEF Discovery Program), Community Supported Agriculture (CSA) shares, and community farm events like the Solstice Celebration. 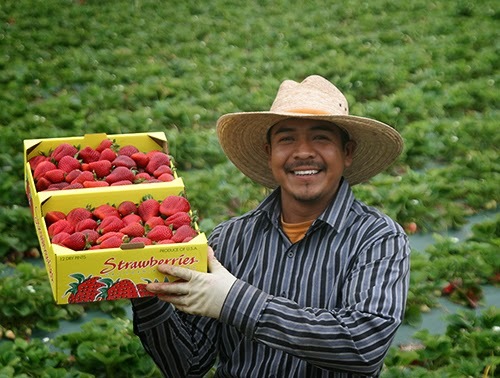 LEF farm workers enjoy above-average wages, year-round employment, and variety of tasks during any given week. Tom and his wife Constance feel fortunate to be raising their children on the farm. Outdoor, nature-based learning appeals to kids. The children observe and participate in the work of their parents and farm employees. They learn about the responsibilities of caring for animals and plants under varying seasonal conditions. Tom and Constance are passionate about providing ways to allow other children first-hand experiences with plants and animals on their farm. 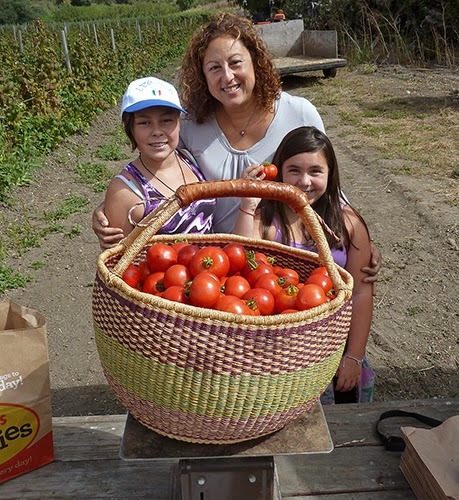 Their nonprofit LEF Discovery Program (LEFDP) provides several ways for kids and adults to learn about how a farm works to provide sustainable organic food for its community while keeping the greater environment healthy. 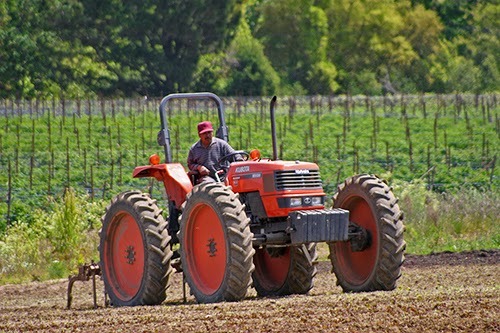 Farm tours, field trips, farm camps, and school programs are examples. You can support LEFDP directly at the Solstice Celebration: 20% of proceeds from U-pick strawberries, raspberries, and apricots will help fund this vital educational program. Equally important to LEF’s community ties is their Community Supported Agriculture (CSA) program. 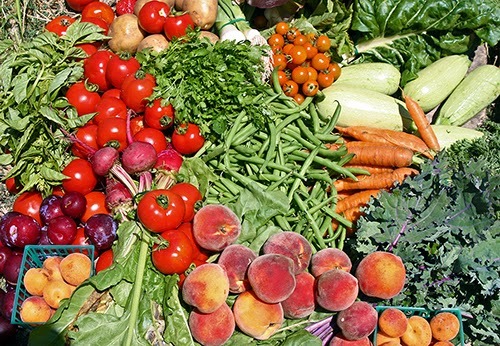 CSA members receive a weekly share of LEF’s organic produce. This partnership gives the farm a known produce market, helping with cash flow, while providing the member with fresher, higher quality produce than is available in stores. LEF offers small or large Traditional Shares, chosen by the farm based upon what’s ripe in sufficient quantity that week. Alternatively, a Choice Share allows members to select their own produce weekly. CSA members can also sign up for a weekly delivery of extra fruit, farm fresh eggs, and locally made breads. For those who’d like to try out the CSA without a season-long commitment, a 4-week trial share is available. Deliveries are made throughout Santa Cruz county, as well as to Monterey, Salinas, Gilroy, Los Gatos, San Jose, Palo Alto, Mountain View, and more.